Welcome Students of Montclair State! What can the SGA do for you? 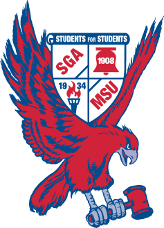 The SGA is a not-for-profit corporation serving the students of Montclair State University. We oversee more than 100 on-campus organizations, including groups for public service, culture, arts, hobbies, sports, and greek life. Our aim is to enrich your college experience by giving you opportunities to connect with others, explore new interests, and lead your own clubs. Remember, it's your campus, your money, your SGA! COPIES: Get the cheapest copies on campus made for only 5 cents each! MOVIE TICKETS: Buy Movie Tickets for $5 or $7, good at any AMC theater! Please visit us for a complete list of our services. The SGA meets at 3:00pm every Wednesday in room 411 of the Student Center during the fall and spring semesters.